The quick two-hour flight from Dubai to Riyadh was merely long enough to whet my appetite for the 19hr Riyadh to Los Angeles longhaul to come on the same aircraft. We checked in a few hours before the flight in Dubai’s Terminal 1. It originally appeared there was no priority check-in, but we found the queue in a separate area to the right of the main check-in area. After clearing passport control and security, we spent about 90 minutes in the SkyTeam lounge. Our boarding passes indicated boarding would begin one hour prior to boarding, so we left the lounge at around 5pm to ensure we were first to board. As the boarding pass indicated, precisely one hour prior to departure the boarding process began. A separate “Sky Priority” line was available for premium cabin guests and those with elite status. A FA named Mohammed was standing at the door and nodded to us as we boarded. 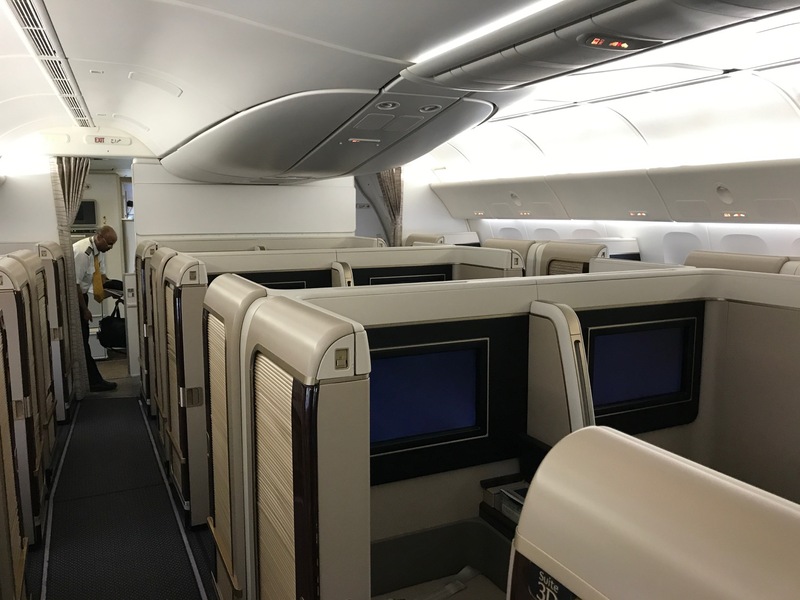 The Saudia First Class cabin has 12 closed-door suites in a 1-2-1 configuration. We were first onboard and snapped a few pictures of the cabin before settling into our seats. I know that sounds horrible — and it was unprofessional for sure — but the purser had a big smile on his face while he was doing this. It was by the far the friendliest Saudi I’ve ever met. He let out a big laugh as he gathered his belongings and made a comment that he would just have to find another seat in the cabin. Oh the hard life of a Saudia purser! The Suites are impressive in design. Not unique (you’ll find a similar config on a number of carriers in first class), but well-thought out and comfortable. I also like the Saudia color scheme, which I think will stand the test of time. The suite offers a high degree of customizability via a passenger control module adjacent to the seat. Lights can be dimmed, a massage function can be turned on, lumbar support can be adjusted, and of course the seat can be adducted by section. An ottoman provides serves as a comfortable footrest or also a guest seat if you wish to dine with a fellow traveler. Against the window the counter lifts up to give access to the bi-fold tray table and a deep storage compartment with USB plugs, a universal power port, and plenty of additional space. Each suite offers a personal air vent (controlled by twisting it). A closet is just large enough for a garment bag or other narrow bag. The first class cabin offers no overhead bin. If your bag does not fit under the ottoman in your suite, a FA will store your bag in a closet. Sadly, though, the aircraft is less than a year old and the seats were already falling apart. Slats were broken in nearly every sliding door. The counter had many scuff marks. The leather above the closet was already cracked. And the seat across the aisle from mine had a large red “inoperable” sign on it. At least Mohammed would not be sitting across from me! Prior to takeoff, FAs offered a choice of warm or cold towel as well as a smoothie with dates or a mint lemon drink. The date smoothie was good, though the mint lemon drink would have been more refreshing on a hot Dubai evening. No menus (or amenity kits) were distributed on this short flight. After takeoff, a FA offered Arabic coffee and dates, without a napkin or dish. Moments later another FA offered the same thing, seemingly unaware her colleague had just served me. A few minutes later, Mohammed (the junior FA, not the purser) asked, “Do you want to eat?” then offered me a choice of chicken or steak with no further details. He also offered more coffee and dates. I chose steak and moments later the entire meal was served on a single tray. I don’t like trays in business class, let alone first class, and this flight was long enough for proper service, especially considering the cabin was only filled 5/12. The meal was fairly good. The steak was overcooked, but thankfully less like a steak and more like two beef kofta patties. It was served with cooked tomatoes, roasted tomatoes, broccoli and carrots. On the side was bread, a Greek salad, a sliver of honeydew melon and mango, and a small coffee cake with white icing. Bread was offered from a basket. A glass of water was proactively offered with the meal, but nothing else. I had to flag a FA down to order some lemon mint juice. After dinner, Mohammed offered me coffee or tea. I requested a cappuccino but was told it was not available on this flight. So I chose tea instead, which was served in a rather tiny cup. The bathroom was clean, though not larger than standard. There were a few extra amenities on the counter and a nice flower on the mirror. I noticed a drain on the floor — thankfully there was no hose available…there’s nothing like a wet lavatory floor, even when wearing shoes. I’ll have a full 777-3ooER IFE review for the connecting flight, but just a couple notes here. After the safety video and prayer, I passed a few minutes by playing my favorite airline game, “Hidden Object Hunt”. Next, I finished a move called Table 19 I began watching on a United flight last month but never finished. Saudia edits quite liberally, so I don’t know how much of the movie I actually missed. And that was it. The lights were soon dimmed, mood lighting turned on and I just tuned into the moving map for the remainder of the flight. I’m glad this was just a flight to get me to the real flight, the 19hr RUH-LAX flight (via JED) that I will review next. Had this been it, I certainly could properly review the seat, but not so much the rest of the onboard product. It’s sad that the brand new 777-300ER Saudia Suite is falling apart already. It’s also sad that Saudia pursers don’t seem to lift a finger. But you cannot beat this seat for a flight of only two hours. The meal wasn’t bad either and even the service was far better than my previous trips in Saudia Business Class. Upon landing in RUH, first (and business) class passengers were transported to the terminal in a “luxury” bus. Read Ben’s take on the flight here. Next: the first class lounge in Riyadh. I find the lack of overhead bins a huge drawback. What’s the purpose? On a short flight it doesn’t matter much, but on a long flight I might retrieve something three or four times from my bag in the overhead bin. How annoying to have it stashed away in an inaccessible place. The lack of overhead bins is primarily for the crew/pilot bunk (which is just above the middle of the first row) & for the decorative ceiling light.However, yes it would be reallyannoying for long haul flights. It’s a small thing, but I’m glad you made note of the fact that your date was served right on your tray table without a napkin or plate or even a little paper liner. I’m not a germaphobe by any stretch, but that’s gross. Tray tables are some of the dirtiest surfaces near where you sit, and to place food directly on that surface is disgusting and especially shocking and lazy in first class. Can’t wait to read your take on the rest of the flight. Well, I’d say at least 50. Hardly a representative sample for 30 million people, don’t you think?